Arizona Foothills Magazine, the premier lifestyle magazine for the prestigious foothills communities of Arizona, has named The Frutkin Law Firm, PLC as the Best Estate Planning & Trust Administration Law Firm in the state for 2013. The award, which is part of the magazine’s annual “Best of Our Valley” reader’s poll, recognizes the firm’s expertise. This award - along with a number of individual honors - adds to a long list of accomplishments over the past few years. The Firm’s estate planning section recently expanded with the addition of well-known Scottsdale attorney David Tatkin in December. The Firm helps businesses, individuals, and families with wills, trusts, asset protection strategies, business succession planning, probate administration, trust administration, and trust and estate litigation. Over the past few months, the firm named Carolyn Tatkin and Adam Buck as the two newest partners and hired two new attorneys. They also relocated their office within Scottsdale to the Kierland Commons. The Frutkin Law Firm now consists of nine attorneys with decades of combined experience in the core areas of business law, bankruptcy, estate and tax planning, and civil litigation. 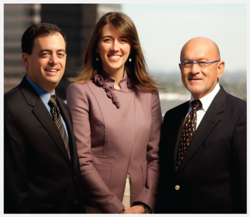 For more information on The Frutkin Law Firm and its awards, visit http://www.frutkinlaw.com.